As the war wore on into 1943 and 1944, the blitz was over and it seemed that the allies were gaining the upper hand. Consequently we heard the air raid sirens less and less and, even when they sounded, we just carried on in school. Few people continued to carry their gas masks everywhere and we were all a little more relaxed. We had become used to the shortages of course and had learned to cope with the rations we were allowed. As we had more margarine than butter some people mixed the two together to make a slightly more palatable tasting substance. Also we were able to make our own small piece of butter by taking off the cream from the top of the milk bottle and putting it in a jar of some kind – we used a Horlicks jar – and by continuously shaking this for about 20 minutes or so, which was a job I liked to do, we produced a pale version of “butter”. I suppose it was really clotted cream but we added a little salt and it helped out on a few pieces of bread. The Deputy Headmaster at West Mon was Mr Reginald Thomas Mole; he taught art and manual instruction and, after 41 years at the school, retired at the end of term in July 1946. As he was also the master in charge of stock, we were continually told by him to use every single page in our exercise books; indeed it was useless to ask for a new book if you didn’t comply with this as he used to flick through every old book presented to see that all the pages were full. If they were not, you didn’t get a new one. The quality of the paper in the books fell off as the war wore on with the surface becoming rougher. One thing I was terribly disappointed about was not being able to do any woodwork. When both my brothers attended West Mon they used to arrive home, from time to time, with a variety of items they’d made in their woodwork lessons and I just couldn’t wait until it was my turn. I just managed one single lesson before the stock of wood was exhausted. Then it was announced that there would be no more woodwork lessons. That was something else Hitler had to answer for! Some time during the war, I’m not certain when, an Air Training Cadets group was formed at West Mon. It was not something which was widely advertised amongst the boys and I gathered that it was something to keep the boarders occupied. As the master in charge of the boarders, Gilbert Garnet, was also the officer in command of the cadets, that is quite probable. We boys were very interested in aeroplanes and my best friend, Eric Smith, who sat across the aisle from me in 2A, and who lived next door to me at 8 Wern Terrace, spent hours drawing bombers dropping bombs, shells exploding near them and fighters shooting them down. One Monday morning we arrived at school to find an air of excitement about. Someone told us that there was a real aeroplane in the quadrangle at the side of the new building. Hardly being able to believe this we made straight over to investigate and, sure enough, there was a low-wing monoplane parked there. We could actually walk around and touch it and even get up to look inside the cockpit. We referred to it as our “Spitfire” though I don’t think it could have been as the Spitfire was a very new plane at that time. Still, it caused a lot of interest and excitement until it was finally removed and, I suppose, loaned to some other school. I imagine this was an effort to get boys interested in the Royal Air Force as no one knew then how long the war would last. I distinctly remember some of the older boys, who were prefects when I started at the school, who were called up almost as soon as they had left and visited the school later in their forces uniforms. Two years after leaving West Mon I was in the Royal Air Force doing my two years national service, though by then the war was over. It was about a year after the declaration of war that we started to learn about the realities of the situation. The blitz by Hitler’s Luftwaffe started on our towns and cities. London was one of the main targets but other cities were badly damaged also, Swansea being one of them. Newport also suffered to a lesser extent and, as I had an aunt living there, I saw some of the effects of wartime when we visited her. I clearly remember the circle of huge, grey barrage balloons surrounding Newport town centre. We lived in a house, Garfield, in School Lane, and many is the night we stood at the window of our parents’ bedroom which looked south over the playing field of George Street School and watched the searchlights over Newport sweeping the night sky. We could hear the thuds but didn’t know whether it was gunfire or bombs dropping. Occasionally we saw what looked to be fires. They showed up starkly in the black night as, of course, the blackout was in force then and, unlike today’s sodium light halo over most towns, all that was usually visible was intense blackness all around. I can only remember two incidents of bombing near Pontypool. One day the grapevine vibrated with a rumour that, the previous evening a bomb had dropped on the Wheatsheaf Inn near the market. However, later rumours suggested that, as the damage to the pub was slight, it had probably been a shell cap which fell near it. We had many warnings when the air raid sirens went off, so much so that, when nothing happened near us, we started to take little notice and carried on as usual. However, there was one evening when we had a real fright. I think it must have been about August or September time. My father, being a keen gardener and having quite a large garden devoted to vegetables, we had plenty of runner beans at that time of the year. I was in the kitchen with my mother watching her prepare the beans for supper when, suddenly, there was a terrific explosion. Everything in the house vibrated and the crockery in the cupboards rattled. I felt sure a bomb must have dropped in Wainfelin Avenue. As it turned out a land-mine had been dropped on the mountain much higher up the valley in the Varteg area. When the blitz started in 1940 I was in the scholarship class in Town School. (https://oldpontypool.wordpress.com/2008/07/03/the-scholarship-class-at-town-school) When the sirens sounded we were all sent home. Most children lived fairly locally and so were able to go to their own homes where, in those days, mother was always home. But some of us lived further away from the school as I did, so arrangements were made for us to go to the home of someone else who lived near the school. I was partnered with Billy Wootton who lived near the top of the Bell Pitch at Coedcae in a little cottage with a small raised yard at the front of it. Billy had an airgun and we often spent the time when the weather was dry out in his yard shooting at a target. Mrs Wootton was a very generous person and would often provide me with refreshments. 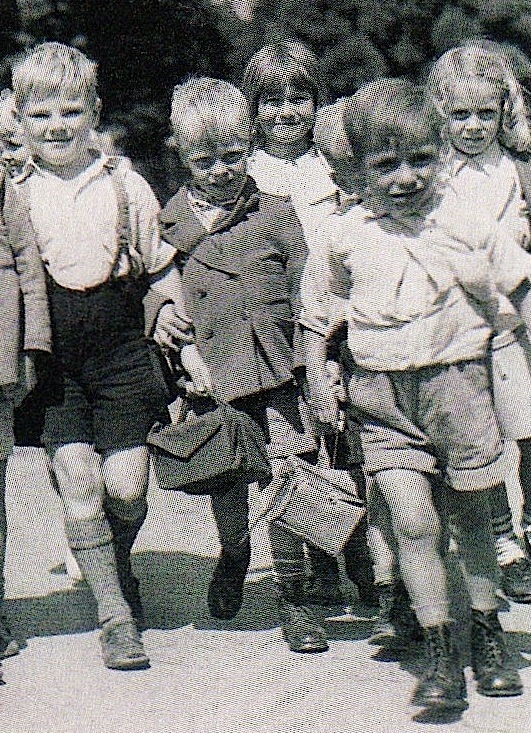 If the air raid was short-lived we had to return to school as soon as the all-clear sounded, but if it did not sound before ten minutes before our usual home-time, we didn’t have to do so. At home-time I was free to go home in any case. I quite enjoyed the air raids. Later, when I attended West Mon, we were so used to nothing happening during daytime air raid warnings that the practice was abandoned and we stayed in school. Adolf Hilter has many things to answer for, but, as a nine-year-old boy, I never forgave him for messing up my holiday in 1939. Not everyone had paid holidays in those days but my family, most years, managed a holiday, by train of course, to one of the traditional holiday spots. In August 1939 we were spending two weeks in Weymouth. The weather was lovely but the news from Europe wasn’t. Germany had annexed Austria on 12th March 1938 and from then on it was all downhill. By August 1939 the British Government were openly talking about the possibility of war with Germany and what they would have to do if it happened. One thing on the cards was the probable bombing by the German air force of the main British cities in the south of the country. Consequently, during the last week of August the news bulletins on the wireless were talking about the government commandeering trains to evacuate children from the cities to the countryside. My parents were most concerned about this and feared that we might be denied a train to get us back home. Therefore they decided to cut short our holiday by three days and to return home. Hence my intense dislike of Adolf Hitler. One of the things we took home with us was a 7lb tin of tea with a sealed top to prevent contamination from a gas attack. Being so young I didn’t realise the implications but I know a hush fell on the whole family. We were told never to go anywhere without our gas masks and the little box hanging by string over everyone’s shoulder became a common sight. However, this fact is often misinterpreted in dramas about the war on television. Only last week I saw a scene with a group of elderly people all with the little cardboard box slung over their shoulders. Soon after we started carrying our gas masks, covers of all sorts were on sale in the shops and many people knitted or sewed their own box covers. This was really a necessity as a cardboard box would not have lasted long when we were out in the rain. When the war started our merchant shipping was scattered all over the globe. Our merchant fleet was huge in those days and our ships earned a massive amount of money for the exchequer as they freely sailed all over the world, particularly amongst the countries of the British Empire. Consequently, as they had no Royal Navy escorts, they were easy targets for German warships and U-boats; we suffered huge casualties and a lot of food and other goods intended for the home market never arrived. Because of this the coalition government under Winston Churchill decided to introduce a system of “fair shares for all” food rationing. My clothing ration book at the end of the war. I’ve kept it ever since. As the gas masks arrived so sweets disappeared. Ration books were issued to everyone, firstly for food products but later for things like clothes and furniture. Butter, bacon and sugar were the first items to be put on ration in January 1940. Meat and preserves followed in March and margarine and cooking fats in July. Cheese was added the following year until, eventually, just about everything was rationed. We were required to register, with a particular shop of our own choosing, for our main food and, each week, the grocer would cut out the relevant dated coupons from our ration books. He would then have to exchange these coupons at the Post Office for vouchers to purchase more food for the following week. 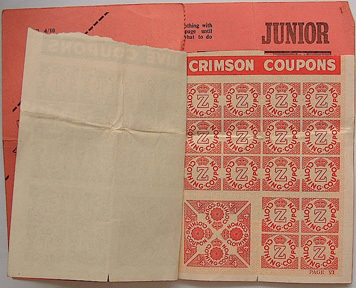 Ministry officials were employed to check these coupons on a random basis. Although the war lasted only five years, rationing continued for 14 years. The only fruit available was that grown in our own country, such as apples, pears and tomatoes. Items like oranges and bananas were not on ration, they were simply not available to the general public, though some children and expectant mothers could obtain them. The things that my friends and I missed most were sweets. For these my family registered with Emma Truman who ran a stall in Pontypool market on Saturdays; she also had a shop on the upper part of George Street. By putting all our rations together we managed to fill a small tin with boiled sweets each week, and Emma was generous enough to sometimes put in a few extra sweets. At its lowest the sweet ration was down to two ounces per month so that we were reduced to buying things like cough sweets at the chemist’s. One good thing about rationing was that we were all very healthy and certainly had no worries about being obese. 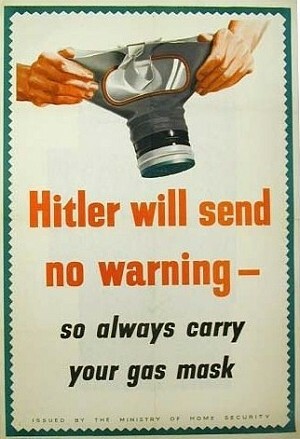 * Additional note: It’a amazing how many TV dramas get the gas mask idea wrong. One of the first things we did when we had our neat little cardboard box was to write our name on the box in large letters. Some artistic people even decorated them with drawings. You can imagine the confusion in schools if all the pupils hung their gas masks in the cloakroom without any names. Not very hygienic either! 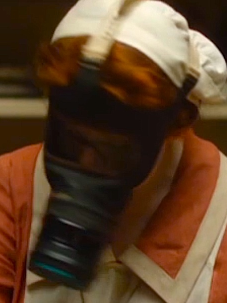 In the BBC “Upstairs Downstairs” drama in February 2012, they show the cook wearing a gas mask even before war was officially declared. 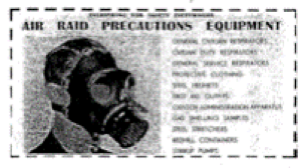 I suppose that might have been possible in London, but the version she is wearing is the long version of the gas mask with the added filter which was not issued until about six months after war was declared. Another consideration was, of course, the weather. A number of dramas on TV show people carrying around those neat little cardboard boxes even in 1942 etc. One of my favourite dramas, “Foyle’s War” always makes this mistake. After carrying around a little cardboard box every day for a few months you can imagine what the British weather would do to it! Therefore people started making covers for the boxes or bought covers in the shops where they were readily available in all sorts of colours. by putting them in waterproof carrying cases. This is the gas mask worn by the cook in “Upstairs Downstairs”. Notice how much longer the filter is. as it was affixed with white tape. As I’ve already mentioned, classes in those days were not strictly arranged in chronological age, and as a result, I spent two years in what was called “The Scholarship Class”. It was when we sat the eleven-plus exam. It was sometimes referred to as the “top class”. I’m not certain whether there was any academic implication in the name or whether it was the fact that, physically, the classroom was at about roof level with the rest of the school. Some of the other children I remember being in this class were: Billy Wootton who was quite a big lad and the only boy in the class who wore long trousers, a sign in those days of an “older boy”. Girls, of course, never wore trousers. There were also: Jean Vaisey, Beryl Doe, Kenny Rice, John Harris, Dennis Virgin and two girls, whose surnames I forget, but were called Mavis and Myra. I’d love to hear from any of these, or any of their relatives. It was the ambition of a lot of boys to go to West Mon and, each year, about 400 hopefuls would turn up at the school in fear and trembling to sit the three exam papers: English, maths and general intelligence. The girls, who wanted to attend the Girls’ County School at Penygarn sat a similar exam. The results of these exams, in order of merit, were always published in The Free Press. Approximately the top 90 boys would be accepted to enter the school and there were scholarships awarded to the five top boys in the exam; this meant that they did not have to pay fees. The rest of us had to pay fees, but they were reasonably small. After I had been at West Mon for a couple of years, all fees were done away with, I presume as a result of the 1944 Education Act. The teacher in charge of the top class at Town School was Mr Petty who lived in Griffithstown. He was a slim, tall, angular man, with a very business-like stride and was a good disciplinarian. He was a member of St Hilda’s Church, Griffithstown. I recall some parents saying that, when the new head had been appointed, they thought Mr Petty would have had the job. In the event, J.P. Lewis was appointed. Mr Petty gave me a real love of the English language and literature which has grown throughout my life. Some of the lessons he taught were quite advanced for children of ten and eleven. For instance, we read Shakespeare’s “The Merchant of Venice”, parts of Dickens’ “The Pickwick Papers” and “John Halifax, Gentleman” by Dinah Craik. He also taught us the parts of speech and the structure of the English language and how to parse sections of the books we read. We spent hours sorting out the subject, predicate and object of sentences and learning when and how to use relative pronouns etc. We also had a small class library where we could choose a book to read on our own when we had silent reading. I remember I chose H.Rider Haggard’s “King Solomon’s Mines”. Punctuation was also taught and I remember him reading a passage from “The Pickwick Papers” to illustrate how Dickens wrote really long sentences by using semi-colons. I was fascinated. Spelling of course featured very strongly in our lessons and Mr Petty would often organize a spelling B, which I loved. Which nature in her wisdom made. Whose branches tower amid the breeze. That’s it! It’s not Wordsworth is it? But, I suppose, it’s not too bad for a ten-year-old. Maths was the other important subject, although we called it “arithmetic”. Those were the days of “The three Rs”. It was a much more difficult subject then because nothing had been decimalised. There were 4 farthings in a penny, 12 pennies in a shilling and 20 shillings in a pound. In length there were 12 inches in a foot, 3 feet in a yard, 22 yards in a chain, (where we get the cricket pitch length from), 10 chains in a furlong and 8 furlongs in a mile. Consequently long multiplication and division were a real nightmare. We also did mental arithmetic using short methods, many of which I still use today. Lessons on general intelligence we had once a week and these were taught by the headmaster himself, Mr J.P. Lewis, who devised a set of rules which we had to learn and chant. These showed us how to answer some of the questions. For our English lessons we used a few times a week a blue book containing exercises in English comprehension. Each chapter contained a section of a book, or perhaps a poem, followed by questions about it. 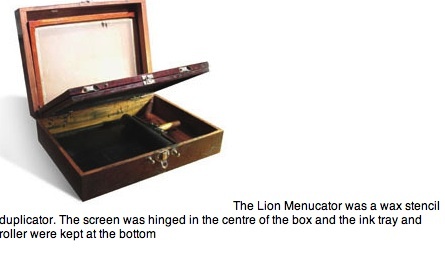 Mr Petty was so keen on us doing well at this that he wrote out his own book by hand on wax stencils, ran them off on a Lion Menucator,* bound them in brown paper and fastened them together by punching all the sheets with holes and threading string through. He must have spent hours doing this. He produced over 30 books with something like 50 pages each. As we approached the exam time, I remember he arranged for those of us entering the exam, to go to school at 8.30 instead of the usual 9.00a.m. to have an extra lesson. Now that’s what I call dedication.